October 30, 2013 - The Department of Transportation’s Office of Inspector General Assistant Inspector General for Aviation Audits testified before the House Committee on Transportation and Infrastructure Subcommittee on Aviation regarding the Federal Aviation Administration’s (FAA) certification process. The Assistant Inspector General focused on the FAA’s certification processes in three areas: (1) FAA’s Organization Designation Authorization (ODA) program; (2) certifying new air operators and repair stations; and (3) Next Generation Air Transportation System (NextGen) capabilities, including integrating unmanned aircraft systems. The Assistant Inspector General stressed that effective oversight is critical to ensure that all ODA organizations (i.e., organizations that perform certification work on the FAA’s behalf) are following FAA’s established certification policies and procedures. He also stated that issues with the FAA’s Flight Standards approval process, resource management, and communication from Headquarters have led to a backlog of more than 1,000 aircraft operators and repair stations awaiting certification. Of those awaiting certification, 138 applicants have been delayed for more than 3 years, with one applicant waiting since August 2006. These delays demonstrate the need for an effective and efficient certification process that ensures safe operations while supporting economic growth. We have identified a number of factors that have likely contributed to the FAA’s backlog. First, the FAA’s certification process itself has led to delays. The FAA lacks an effective method to prioritize new certifications for air operators and repair stations. Instead, the Agency uses a first come first served approach to certifications. As a result, many applicants may be significantly delayed if more complex certifications are ahead of them. For example, a large Part 135 carrier applicant that requires extensive inspector staff time and effort due to the size and complexity of the operation could delay all new certifications. The FAA guidance provides flexibility for field offices to “pass over” more complicated applicants in the process when specific resources are not available to perform those types of certifications. While this flexibility would allow less complicated certifications to move quickly through the backlog, this process is seldom used. The FAA is currently working on refining the guidance to streamline certifications. Second, the FAA lacks a standardized process for initiating new certifications. The FAA has not provided a reliable and objective method or guidance to its offices for determining when resources are available to initiate new certifications. When the FAA receives new applications, an evaluation of available inspector staff should be performed to determine whether the certification can proceed. If resources are not available, the FAA can determine whether to wait-list the applicant or transfer the certification to a different field office with more work capacity. Field offices are required to communicate with applicants every 90 days regarding their status; however, once applicants are placed on a waiting list there is no requirement for the FAA to later re-evaluate available inspector resources to determine when certification for the backlog applicant can begin. Finally, over the last 3 years, poor communication regarding the FAA certification policy has resulted in workflow interruptions and diminished incentive for inspectors to expedite new certification applicants. While the FAA states it has never formally suspended all certification work, figure 2 below shows a variety of frequently changing guidance and inconsistent communications between Headquarters and the field regarding when to perform and when to halt certifications. For example, in March 2011, the FAA halted most new certification activity. 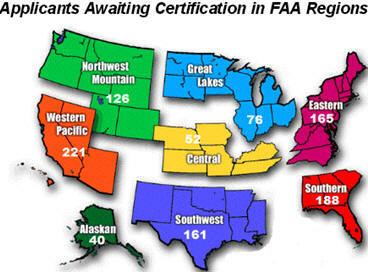 In addition, a large the FAA regional division stopped new certifications twice over a 1 - year period. Also, as recent as June 2013, the FAA stated that Headquarters must approve any new certification work at field offices. According to the FAA representatives at both the regional and district office levels, these cessations in certifications were due in part to ongoing budget issues and sequestration, coupled with the need to maintain safety oversight of existing operators. Finally, the Assistant Inspector General warned that a growing demand for certifying NextGen technologies and procedures, as well as FAA’s need to certify unmanned aircraft systems, will further add to FAA’s certification workload.